I have another DIY body scrub recipe for you lovelies!! This is one is my favorite, as it smells just like one of my fave vacation cocktails, the Mojito....instead this is non-alcoholic, obviously. If you don't know what's in a Mojito, it traditionally consists of white rum, sugar, lime juice and mint. Yum! So, when I received my lime and mint essential oils from Barefut, one of my favorite essential oil companies, I went straight to whipping up this yummy body scrub! By the way...if you get on board with Barefut, they have a monthly offering of a free oil to try, you pay for shipping! This month I believe it is sweet orange, which I also have coming my way. Wonder what I'll do with that one?! I also ordered their heel repair stick, as my heels are always cracked (ewww), but now there is a solution en route! 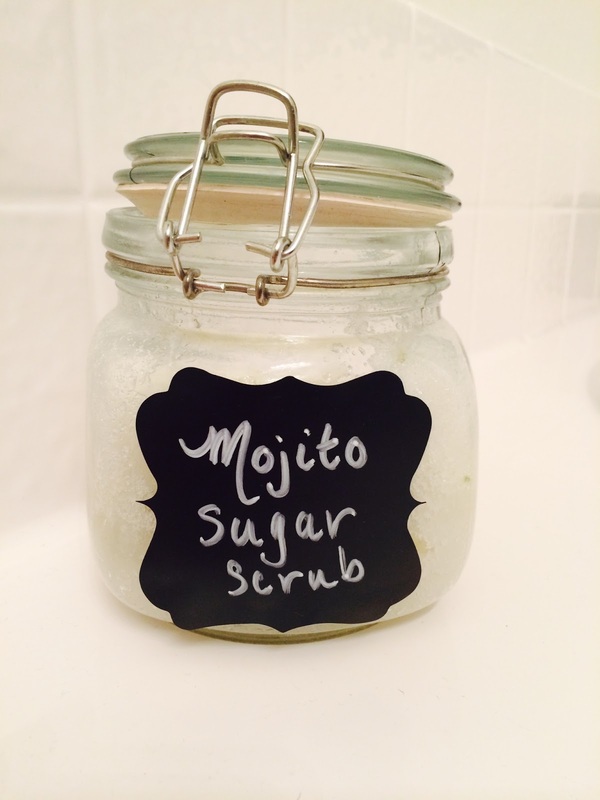 So, here's the how to do this wonderful scrub, that you can make for just yourself, and put into cute little jars and hand out at your bridal shower, bachelorette party, or even at your wedding...especially if you're serving Mojito cocktails as your signature drink! Mix all ingredients up and put into a glass jar with hinge closing lid, and that's it! I like adding the lime zest and mint leaves as it amplifies the scent, and it's nice to see the green flecks come through, but it's really up to you if you feel the need to add that. Use scrub in the shower before you turn on the water. Simply scoop out a bit with a spoon, or your cupped hand, and gently rub the scrub all over body, or hands/feet, and then wash it off. The coconut oil makes your skin feel amazing, while the sugar sloughed off icky dead skin. The lemon essential oil smells amazing, and will uplift your spirits, while also cleansing your skin. Step out of shower and dry off, and you'll feel the amazing difference! Do note to make sure you get all traces of sugar washed down the drain, and that there isn't an oil slick in your shower. There shouldn't be with this recipe, but want to mention that. 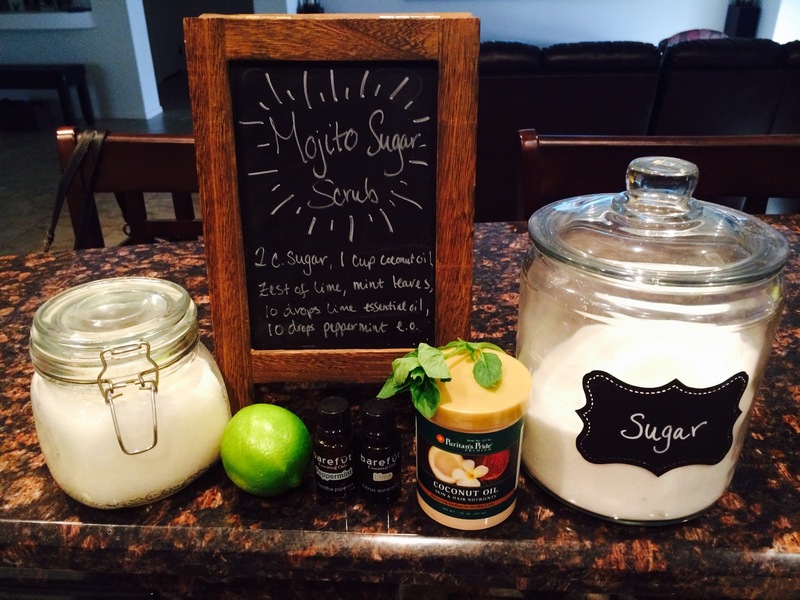 Enjoy your mojito scrub!! Let us know if you make this! Disclaimer, I stand by Barefut, and have become an affiliate for them. I love trying their oils and products. Any products purchased from the links on the blog helps Savvy Deets Bridal function and stay alive, as I receive a small percentage with each sale. All opinions are 100% my own.